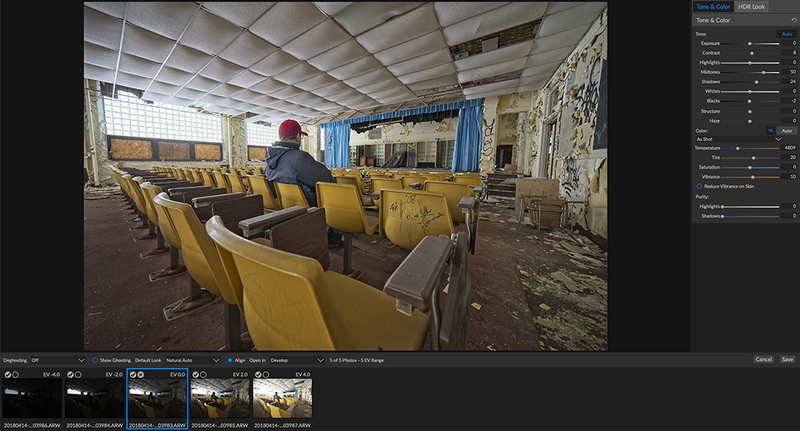 With the HDR tone-mapping feature in ON1 Photo RAW, you can easily merge multiple bracketed photos and recover highlights and shadows in very challenging tonal environments. In April 2012, Adobe announced a new subscription model initiative called Creative Cloud that sat beside its existing licensing model with the Creative Suite. Thirteen months later, in May 2013, it announced that the only way to continue using new versions of its products would be to sign up for a Creative Cloud subscription. The change definitely had an impact, although perhaps not one Adobe fully anticipated. Many photographers took umbrage with this “software rental” model and began searching for alternatives to Lightroom and Photoshop. Enterprising software companies saw an opportunity to fill a gap created by Adobe by building photo-editing software that provides photographers with the tools to edit, organize and share their photos, but without forcing customers into a recurring subscription model. One such company that has been working hard to fill this gap is ON1, Inc., based just outside of Portland, Oregon, in Tigard. ON1 has been a mainstay in the photo-editing software space for years, providing customers with an ever-evolving assortment of utilities to fix, stylize and print photos. One of its longtime standards is its resize utility, formerly Perfect Resize and Genuine Fractals, which leverages a powerful algorithm to scale up photos without affecting quality or sharpness. While ON1’s unofficial modus operandi has been to work seamlessly within your existing workflow, which for many shooters means Adobe Lightroom, its newest offering, called ON1 Photo RAW 2019, is its most aggressive attempt to provide customers with a soup-to-nuts alternative through a flat license fee. The Browse module in ON1 Photo RAW 2019 allows me to manage and review all of the photos in my library. I can rate them using stars, colors or like/reject and am able to filter by that metadata, as well. ON1 understands that it needs to provide customers with all the tools they’d normally use from other products, like Adobe’s, to accomplish certain tasks, and over the years, the company has worked to add them in. 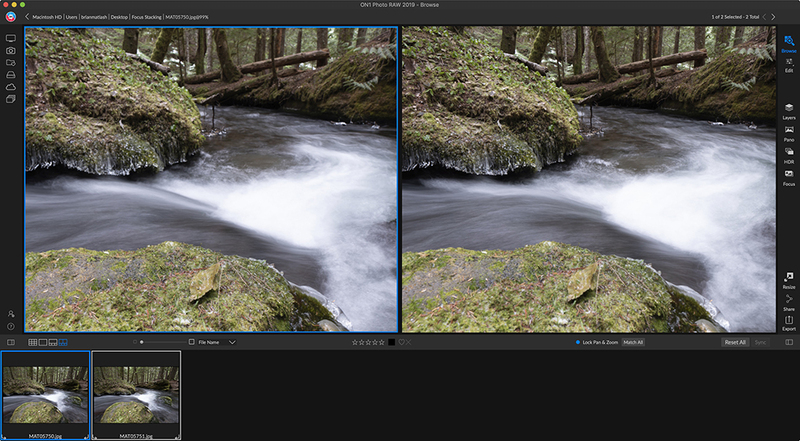 Recent versions of ON1 Photo RAW introduced key features like eponymous raw-photo processing, HDR tone-mapping and panorama merging. One of the most important utilities that potential customers were looking at centered around Digital Asset Management (DAM). 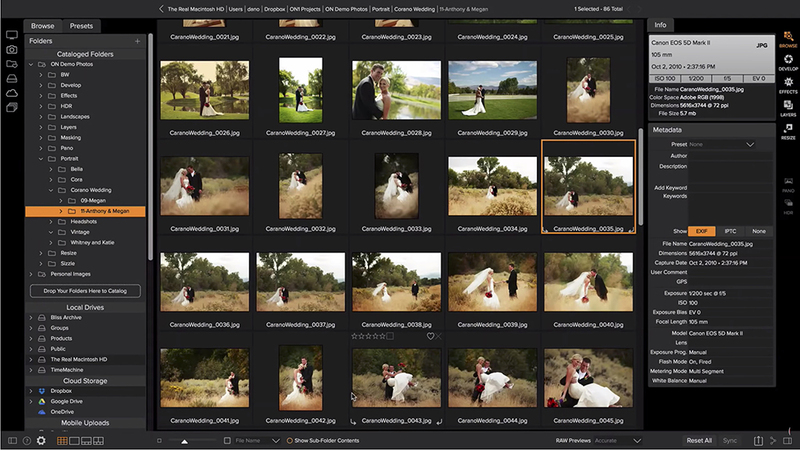 In order for ON1 to truly offer a bona fide alternative to Adobe Lightroom, it would need to provide customers with a way to organize, review and rate their photos, along with methods to import new photos and export for distribution. Without it, customers would still need to rely on other software to manage their photo catalog. ON1’s solution is a module called Browse, which provides users with a versatile photo browser that supports a variety of raw file formats, metadata display and commonly used rating systems like stars, colors and keep/reject. The user interface of the former ON1 Photo RAW 2018 was powerful but fragmented. It required the user to jump between multiple modules as part of what should be a unified workflow. 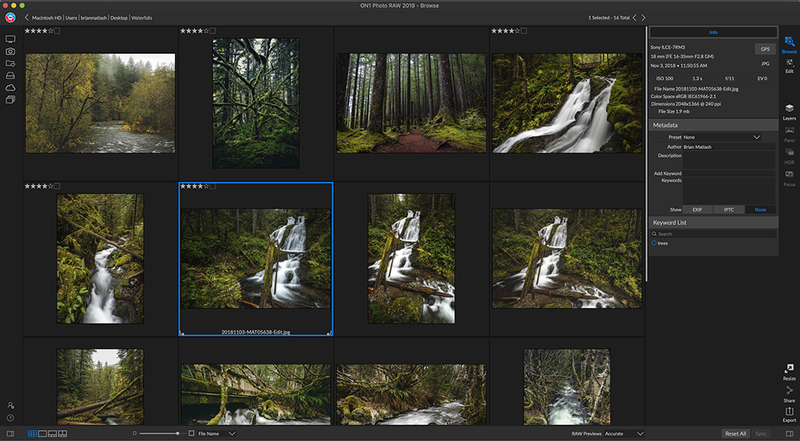 To further facilitate bringing existing Adobe Lightroom users into its camp, ON1 Photo RAW 2019 includes a bolstered Lightroom Migration Tool that not only replicates folder, collection and metadata structures but can now also re-apply edits previously made, including local adjustments. While this is a novel approach, it’s worth noting that the actual results can vary because of the inherent differences between Adobe’s and ON1’s Raw processors. Simplifying The User Interface (UI): There’s an art to developing complex software apps so they’re approachable without feeling overwhelming and with tools that are discoverable without cluttering. Before ON1 Photo RAW 2019, the User Interface (UI) required the user to navigate through a labyrinth of modules to accomplish a series of tasks. An example workflow path one could expect would be to find a photo in Browse, then go to Layers, then to Develop, then back to Layers and then to Effects. As you can imagine, this workflow could cause frustration for users who are looking for a simplified photo-management and editing platform. Fortunately, ON1 took a hard look at ways to streamline and simplify how the user interacts with the various tools and functions that are built in. 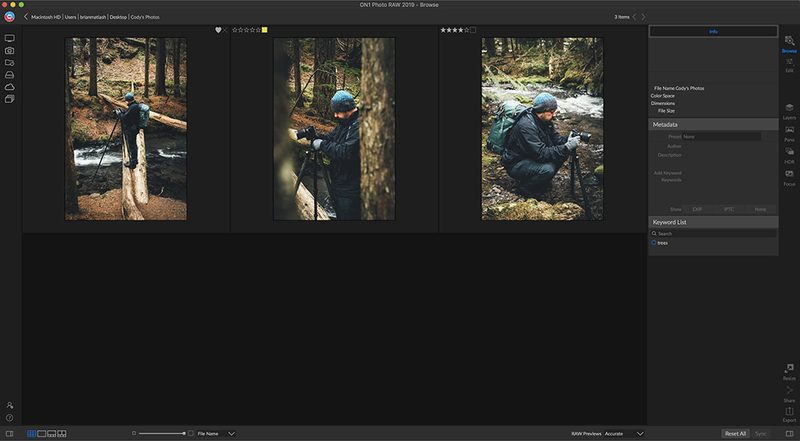 With ON1 Photo RAW 2019, the entire photo-management and editing workflow has been streamlined by eliminating the need to hop from one module to another. Starting at the top right of the UI, the only decision a user needs to make is whether they want to browse or edit. The remaining key features, like HDR, Focus Stacking and Pano Merge, have been made independently accessible without adding clutter. ON1 Photo RAW 2019 brings a much-needed reimagining of how a user will interact with these tools. By consolidating key utilities in one place, the photo editing workflow has become greatly streamlined. Finally, the user has access to the tools needed for resizing and sharing a photo once it’s ready to go out to the world. Focus Stacking: Despite many camera manufacturers’ best efforts, we’re all still subject to the properties of physics and light. If I want to focus on a dominant subject in my foreground, the remainder of my scene will slowly fall out of focus into bokeh. Even with small apertures, lenses still experience a loss of critical sharpness when evaluating a composition from the foreground through to the background. This has been a long-standing issue for macro photographers, product photographers and even landscape photographers. To alleviate the issue of requiring critical sharpness throughout the entirety of a photo, many photographers turn to focus stacking, whereby you take a series of exposures while changing your plane of focus incrementally across the focal plane you wish to retain. These exposures are then aligned and blended together, resulting in a seamless photo with an enlarged depth-of-field. Focus stacking is a new feature built into ON1 Photo RAW 2019, and it’s a clear indication that the company is keeping a finger on the pulse with regard to what tools photographers need to achieve their creative vision. It also fits in with its mission of providing photographers with everything they’d need within one application. Unfortunately, at the time of writing this review, the actual performance of the Focus Stacking utility is substantially lacking and has resulted in subpar images. ON1 does present the user with a disclaimer indicating that it’s working on improving the performance and results of focus stacking, but in the meantime, it’s not a viable alternative to what a user can achieve in Adobe Photoshop. Oftentimes, when I photograph landscape scenes using a very wide focal length and fill a large portion of the frame with a foreground element, I’ll take several exposures with different focal points. I can blend them together during post-processing using Focus Stacking. Text Tool: There are a number of reasons why a user may want the ability to add text to a photo. It’s a common way to add a watermark or copyright information onto a photo. Text can also be used to change a photo into a poster or some other form of promotional material. And, because it’s 2019, adding text is an integral part of turning a photo into a meme. photos, but ON1 has decided to change that norm. With ON1 Photo RAW 2019, users now have access to a Text Tool, allowing them to type in words or paste the contents of their clipboard. The Text Tool gives users access to common features, such as font selection, font sizing, font color, opacity and alignment. You can add multiple text boxes to a photo and discretely alter each. However, that’s the extent to which a user can stylize text with the current Text Tool. Whereas in other applications, such as Adobe Photoshop, I can separate text from the background photo using drop shadows, glows and outlines. With ON1, the user will need to leverage additional layers and blending modes to achieve that task. The needs of photographers’ DAM and editing workflows are as varied as the colors in the ProPhoto RGB color space. But catering to all photographers can lead to a bloated application. 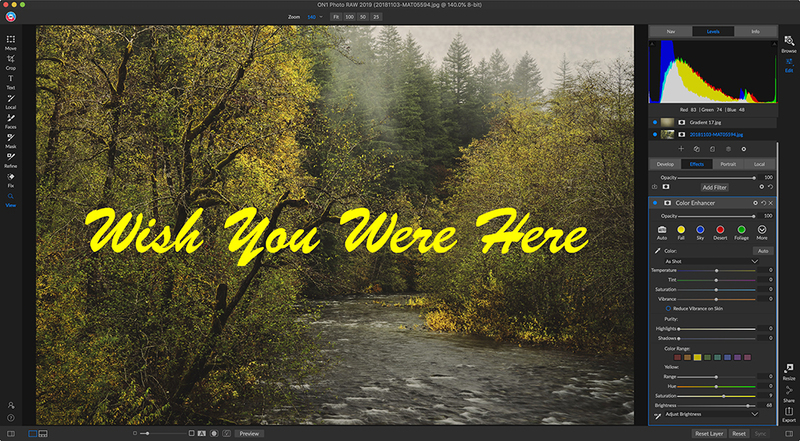 With the new Text Tool in ON1 Photo RAW 2019, I can easily add and stylize a message atop a photo. ON1 does seem to have found its stride with ON1 Photo RAW 2019 by striking a balance between offering powerful tools and providing a simplified UI. This is in addition to the deep editing tools that have matured over the years, offering users a robust assortment of popular stylization techniques, such as cross processing, black-and-white treatments and vintage looks. And by providing users with important utilities, such as a versatile DAM, a layered-workflow system and contextually aware masking, ON1 Photo RAW 2019 should provide many users everything they’d need under one roof. Ultimately, many users will flock to ON1 for one simple reason: They dislike being forced into a recurring subscription service in order to use their apps. Whether they end up staying will boil down to if ON1 Photo RAW 2019 provides the tools and performance that most photographers are looking for at a reasonable price. While some of the application’s newest features are demonstrably lacking at the time of writing this review, it is clear that ON1 is invested in not only remedying these shortcomings but also improving functionality. At the end of the day, if ON1 can fix these issues and make you forget about Adobe, I believe it’s a program worth considering if you’re interested in changing.